View More In Hair Loss Products. 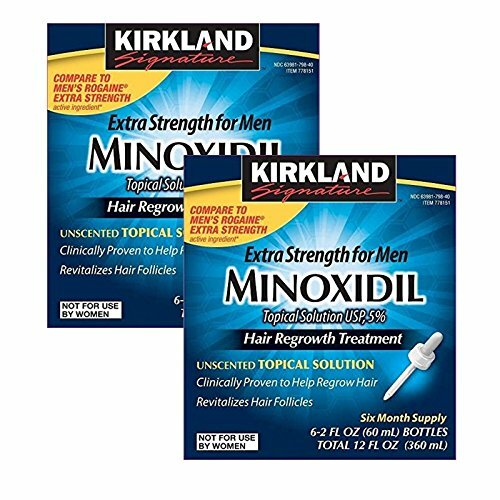 Promote hair growth with the rich formula of the Kirkland Signature Minoxidil 5% treatment made for men. The active ingredient of this Kirkland extra strength treatment is 5% Minoxidil that nourishes the hair follicle to facilitate the hair growth process. Kirkland hair loss treatment may take about 2 - 4 months time for effective results to start showing. Just 1 ml of the Kirkland Signature Minoxidil 5% treatment has to be applied twice daily to give you the best results possible. There is one child-resistant dropper applicator in this Kirkland extra strength treatment, for easy application. Treat thinning hair and balding with this Kirkland hair loss treatment.